In 2005, after having a lot of success with games from Half-Life: Opposing Force to Halo on the PC to our original Brothers in Arms Road to Hill 30, we embarked upon a strategy where opportunity in the industry and the ambition of key talent here was driving a lot of growth for us. The strategy has been amazingly transformative for us. We’ve been growing *very* fast – more than doubling in size between 2007 and 2008 and outpacing general industry growth in staff and revenue by an order of magnitude. This growth has catapulted us to become one of the most powerful independent studios in the world. Our mission has always driven us to always want to strive to do better and better. Our experience has never been greater and we love applying our experience to the benefit of our games. Over the last six weeks, we’ve been adjusting our internal strategy to move from being about Opportunity, Ambition and Growth to a strategy that is oriented towards Quality, Focus and Performance. A number of recent tactical decisions here are a reflection of this new commitment and strategy. The timing of these tactical decisions relates more to natural maneuvering that all studios should only consider after they finish a big effort than anything else. I know there is a tendency in the press to get the maximum value out of a story, but unless we have a *lot* more fans that are *much* more rabid about what we are doing than I thought we did, I don’t imagine there to be much of an exciting story here after all. But, since we do seem to be getting some attention this evening and I am flattered by that and I may as well use the attention. While our commitment to focus and quality may slow the speed of our growth in numbers, we are, in fact, currently hiring. We have exciting, exciting things going on that offer tremendous opportunity for us and our interest is for the best talent in the world to join us and be a part of it. Borderlands is shaping up to be astonishingly fresh and I am very excited to reveal more about that soon, Aliens: Colonial Marines is very exciting and I look forward to the right moment we can more fully unveil our efforts there and we have other incredible unannounced projects in development and a lot of opportunity for the future – a future I am increasingly excited about. 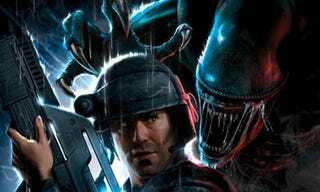 We attempted to clarify with Pitchford the status of the Aliens: Colonial Marines project. He told us that, yes, the game is still in production but couldn't provide an update on its ship date. "But I will say that I am as eager as anyone for us to reach the point where we should reveal it with more detail," Pitchford added.